Sometimes you see a car in your childhood that just sticks with you and then, decades later, you have the opportunity to get one. (What to do, what to do?...) Well, if you're like Don, you buy the damn thing and restore it. Such is the case with this Honda Z600 Coupe. Don saw one as a child and had the opportunity to pick one up thirty years later so, he did. 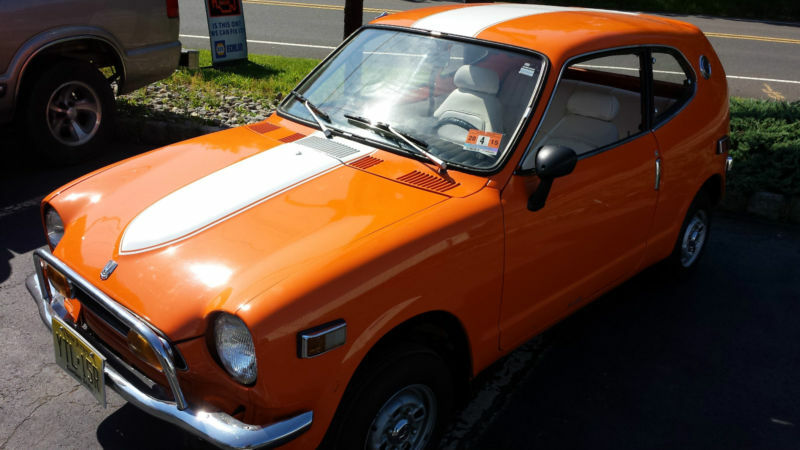 Now, to give you some background on this car, the Honda Z600 coupe is an imported car from the '70's that runs on a 600cc motorcycle engine and is almost small enough to fit in the trunk of his Dodge Charger. No, seriously, this car is less than 11 feet long, has a functional back seat and room in the hatch to carry your groceries. It has 10 inch rims, 5 inch rotors, (yup, it has front disc brakes!) and a 4-speed manual transmission. This is a fully functional car that a 6 foot tall man can drive fairly easily. Ok, the man can't be a Sumo wrestler but if he's under 200 pounds, it's not a problem The car is also fairly rare since only around 300 of them are still known to exist. That in itself, made this car worth saving. When the car was purchased, it looked to be in reasonably good shape with some miner rust to be fixed and then paint it orange and take it to the Syracuse Nationals. Well, a few coats of paint and undercoating hid about a half a million sins and it turned out that this car was actually in pretty rough shape. Had it not been for the fact that Don wanted one as a child and it being quite rare, this poor car would probably have been crusher food. Stripping the paint revealed a lot of bondo and hidden rust and the tar type undercoating showed that most of the metal behind it was rusty enough to literally crumble between your fingers. Most of the bottom 4 to 6 inches of the car had to be rebuilt with metal and about 80% of the metal behind the front fenders that was undercoated had to be replaced. Don used heavier gauge steel than they did in Japan and returned the structural integrity to the car. In fact, I'd go so far as to say, the car is stronger that new. In the process of doing the metal work, he also made some cosmetic changes like getting rid of those gaudy side marker lights, losing the Coupe badges and replacing those rubber strips in the top with metal to make the roof smooth. If you compare it to a stock one you really see how smooth and simple is a much nicer look. 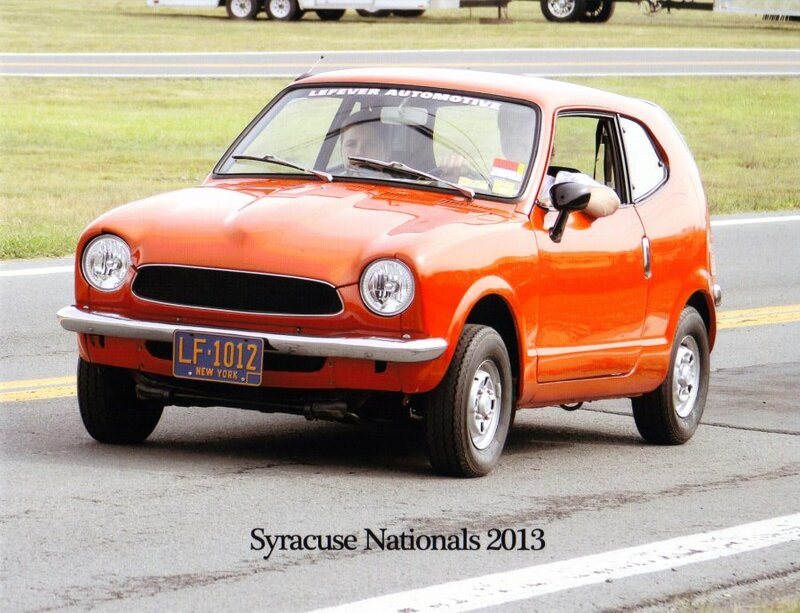 At the Syracuse Nationals, the Honda created more curiosity than the rest of the LeFever Automotive cars we brought combined. .